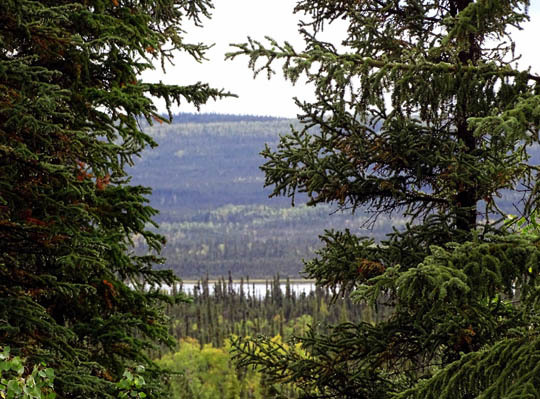 "Winter on Tetlin National Wildlife Refuge arrives in early October and departs by late April. On the shortest day of the year, the sun skims the horizon from about 10 AM to 2:45 PM. state. Temperatures stay below freezing about 165 days of the year." 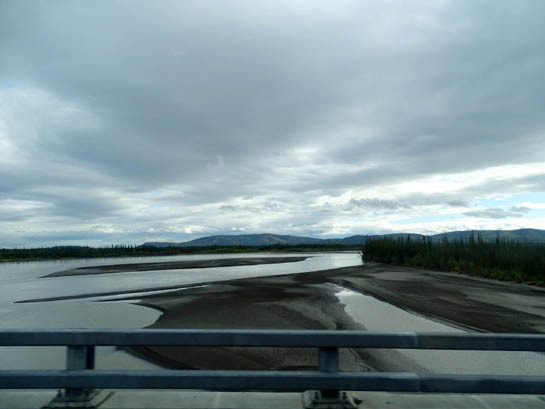 We are parked at a nice pull-off along the Alaska Highway tonight, just across the river from part of the large Tetlin National Wildlife Refuge. We are grateful that it will stay a few degrees above freezing tonight and any rain won't turn to snow . . . we hope. Simply can't imagine what it would be like here in January! In the last entry I described our averted medical "crisis" with Cody. Fortunately, what we thought might be something very seriously wrong with him turned out to be a temporary condition. After going to the vet's office and finding a ramp to get Cody into and out of the truck and camper more easily, we returned to River's Edge RV Park, ate some more breakfast, got online to check weather, news, e-mail, etc. (didn't know if we'd have a connection tonight), and got ready to leave. 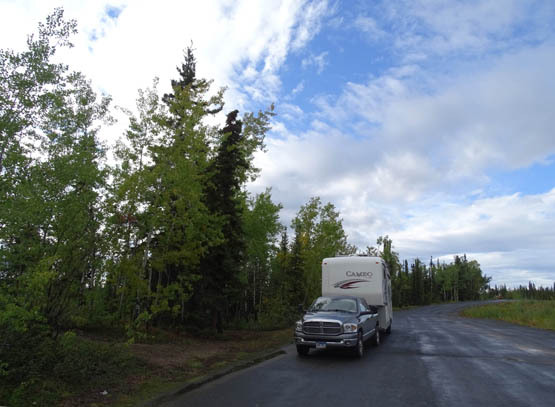 We left the campground in Fairbanks about lunchtime and arrived at our destination -- a large pull-off we found along the Alaska Highway about MP 1251 -- by suppertime. We continued a few miles past the pull-off where we stopped in June in order to reduce the mileage tomorrow to Whitehorse. We're just 14 miles from the Canadian border. This was our last full day in Alaska. I'm sorry we couldn't stay longer but we're tired of cold rain, predicted snow, and the inability to enjoy the great outdoors like we want to. 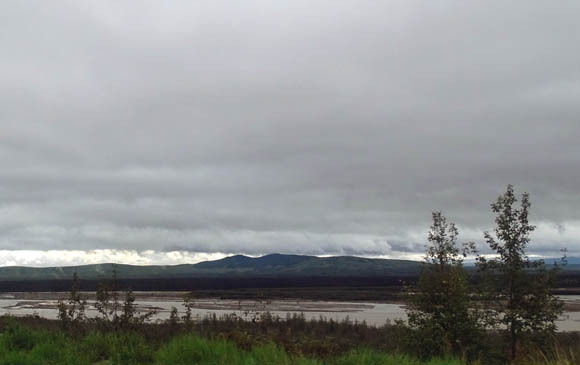 It rained all night in Fairbanks and continued raining all morning. Really heavy rain and 25-30 MPH wind are predicted for this afternoon. 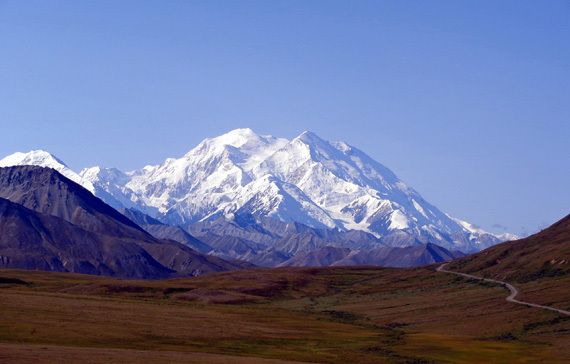 A cold front is coming in a couple days, with snow predicted in the Interior and at Denali National Park -- as low as 3,000 feet. The road on the way to Savage River is higher than that! We got outa there in time, I guess. The last thing we want is to get stuck in Alaska or Canada when the roads are covered in snow or ice. We were on the Richardson Hwy. from Fairbanks to Delta Jct. 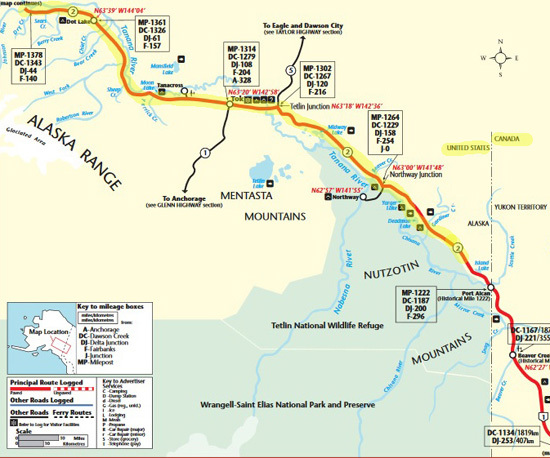 (map above), then the Alaska Hwy. 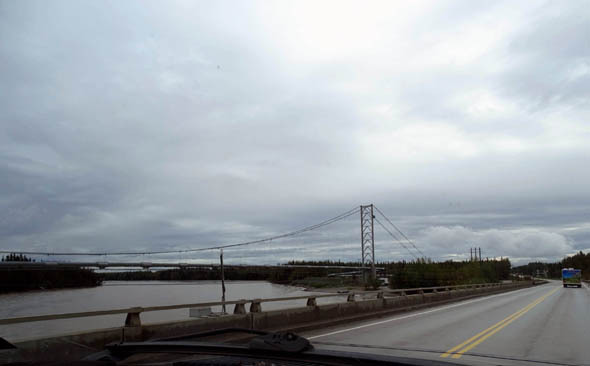 to Tok and our pull-off closer to the Canadian border (below). These 2 maps are from The Milepost. 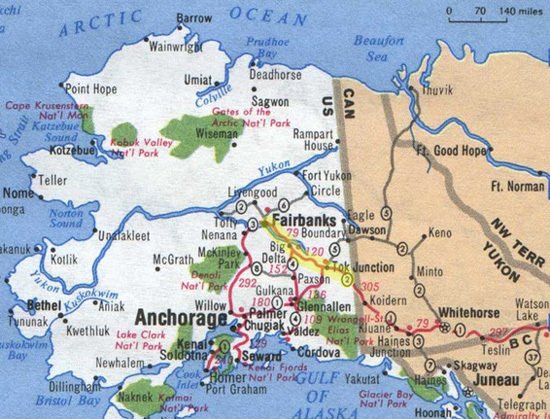 Tok's forecast farther east in Alaska was better today and tomorrow, and we were happy to be out of all the rain by Delta Junction. It was depressing enough with all the clouds; we're glad it didn't rain all the way today. It was partly sunny by Tok but still only in the 50s F. with some breeze. 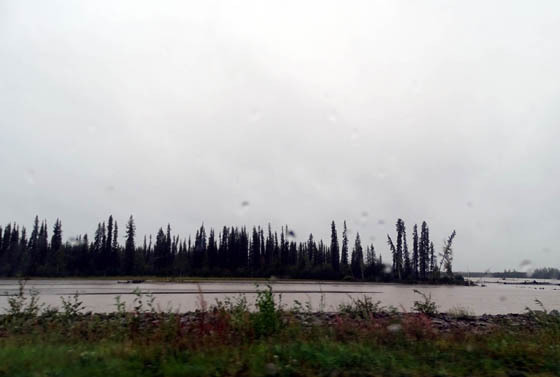 About the same thing happened in 2012 -- rain in Fairbanks and the Richardson Hwy., but sunny by the time we got to the Canadian border. Deja vu all over again . . .
Not much traffic through here, and we're well off the highway. Since we're farther east in the AK time zone I was hoping to see a pretty sunset before I went to bed but more clouds came in and obscured it. The sunshine was nice the short time it lasted. Our first stop was for fuel at Delta Junction (Tesoro price = $3.58/gallon, less Visa's 5% discount). We also fixed our lunch at the nearby visitor center. It was still open this time (closed in early Sept. in 2012) but we didn't go inside. 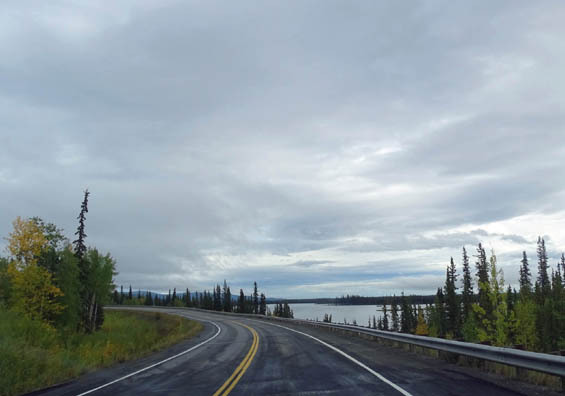 Our second stop was at the Tesoro station on the west side of Tok = $3.41/gallon minus 5%. We had a good phone signal there so Jim got online with the MiFi one last time before we go into Canada. We can use our phones there but it'll be 99 cents a minute. We won't use the MiFi in Canada at all. We did all the financial things we need to do for the next two weeks since it's not safe to use public WiFi for those transactions. We can use public connections for weather updates, news, checking e-mail, etc. if we stay at campgrounds offering free WiFi. Although there weren't any passing lanes on the Richardson Hwy. 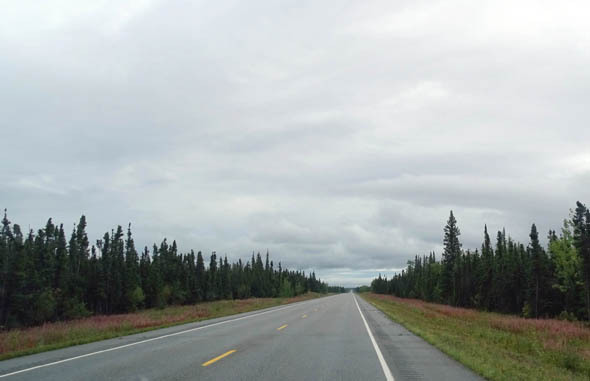 or Alaska Hwy. there were enough long, straight stretches for faster semis and other vehicles to pass us. Jim passed one truck and a small motorhome. He kept his speed under 60 MPH most of the time. There were a few gravel breaks like the ones above but most of this summer's patches have been paved over. Not all the newly-paved sections have been painted yet. The Trans Alaska Pipeline crosses here at Big Delta. East of Tok we could see the Wrangell-St. Elias Range in the distance a little better because the area was more sunny but I don't have any good photos of those peaks. 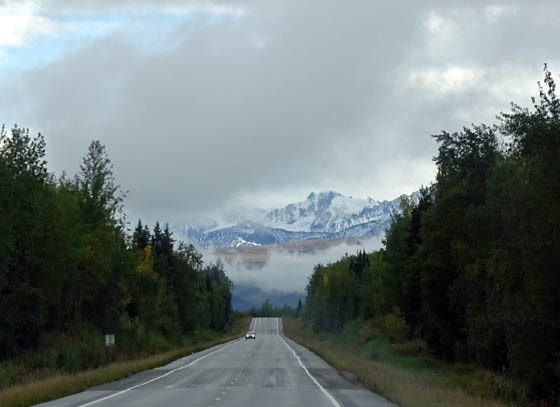 Yesterday we saw seven intrepid bicyclists, male and female, riding north on the Parks Hwy. 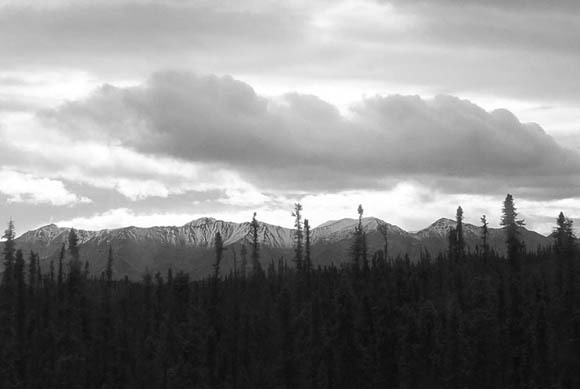 between Healy and Fairbanks. 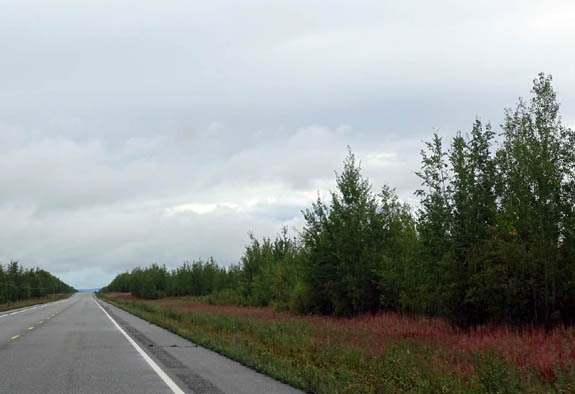 Today we saw nine of them riding east of Fairbanks. We couldn't tell if they were the same people. They don't have numbers and must be totally committed to be out there in cold rain this week. Despite continued rain and clouds this was a much better day than yesterday -- nothing went wrong! Now, on to Whitehorse for probably just one night. 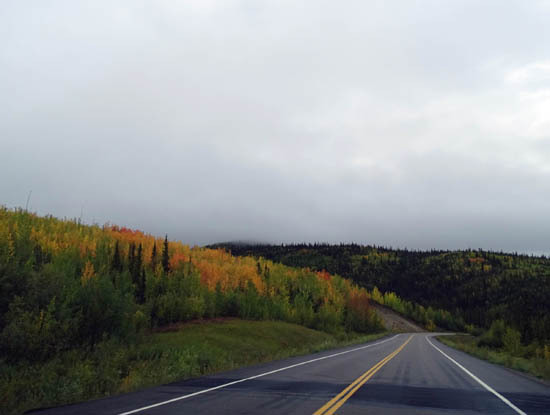 We're playing the rest of the trip through Canada by ear, depending on the weather. 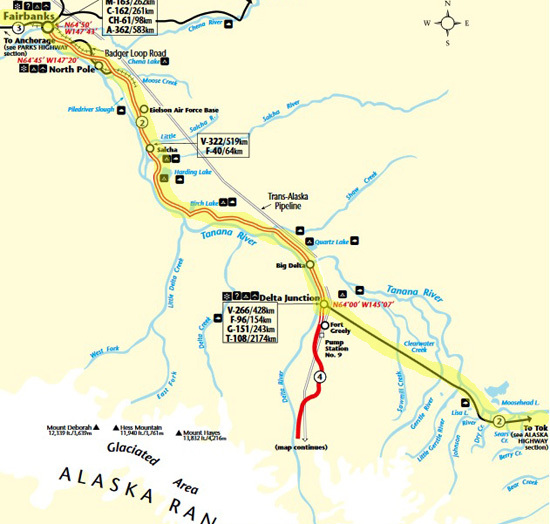 We're considering going down the Cassiar Hwy. 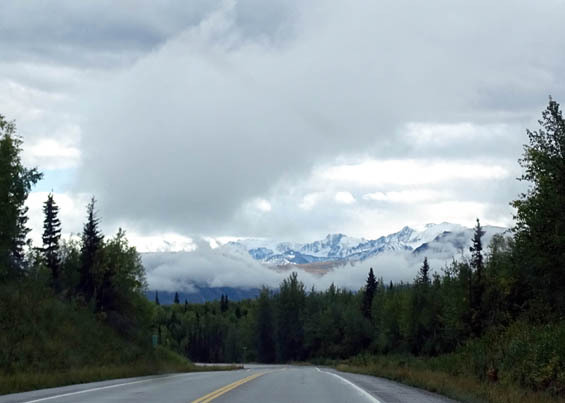 through British Columbia instead of the Alaska Hwy. 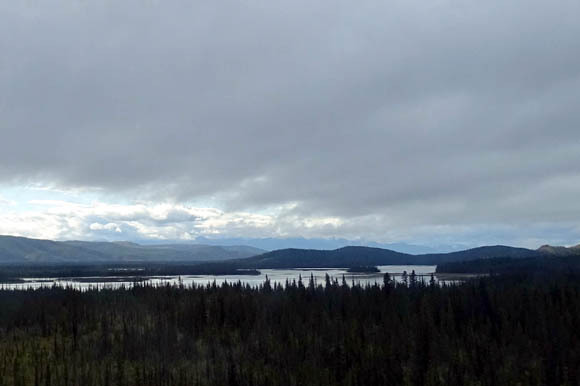 We don't have to decide for certain until we're past Whitehorse and approaching Watson Lake, YT. 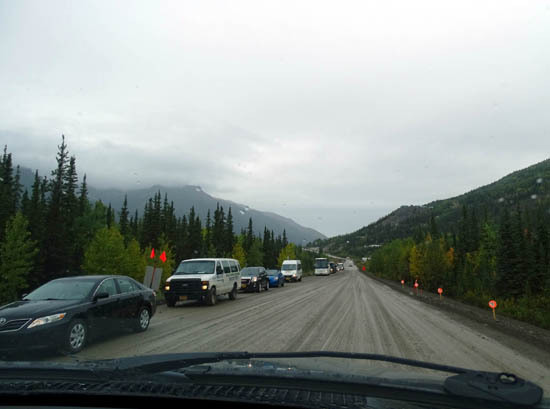 We changed our plans to drive the Cassiar in 2012 because of wildfires and predicted snow. The same concerns are valid this year, too, with wildfires -- and wind-driven smoke -- in the northwestern U.S. and southwestern Canada. We'll probably get to Malmstrom AFB in Great Falls, MT before Labor Day. We don't know how long we'll stay there because it is very smoky now from wildfires in Idaho and Montana. A woman at the Sam's Club in Great Falls told Jim today that even the inside of the store is smoky, just from customers coming in and out of the store. Outside is worse. We hope it's cleared up by the time we get there. One day at a time . . .